There was a time where I was not proficient in Pokemon. I’m still not an expert, but I can at least speak the language. 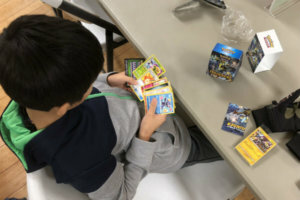 And I have to admit that I’ve come to enjoy the Pokemon prerelease tournaments that our sons attend a few times a year. They pay a fee, get the newest packs of Pokemon cards, and battle against their fellow Pokemon fans. The first couple times I went, it seemed a little tedious. But we parents figured out that if we bring snacks and set up on a table off to the side, the whole event is more of a social affair for all of us. This time we even went to Pizza John’s afterward to celebrate. So I may not have figured out everything about Pokemon, but I know how to navigate a prerelease tournament. We didn’t win the lottery this week. I sort of left you hanging, didn’t I? Then the morning after not winning the lottery, we needed an orthopedist appointment and got one within 45 minutes. And everything turned out to be fine. I’m pretty sure that’s better than winning the lottery. My father’s birthday was last weekend, but my sister Maureen’s mother-in-law passed away unexpectedly last week. So my father spent the weekend driving several hundred miles with my mother and my sister Maureen and her children. Our boys and I had picked out a few gifts for him, so we invited him to bring Grandma and come to dinner one night this week. We had some leftover apple crisp, but I always think it’s nice to have an actual cake for the birthday candles, so I found an ice cream cake, and Leo found and placed the candles on the cake. 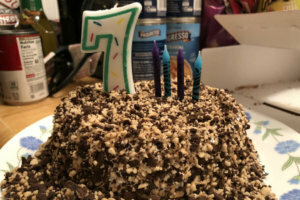 I didn’t even remember that we had a 7 candle, but apparently we’ve had it for almost two years. Our gifts weren’t all that exciting—nothing like the year when we wrapped a box for Grandpa, who is a Wonder Woman fan. When he opened it, there was a slip of paper inside that said: “Contents: 1 Invisible Jet.” We’ll never top that. But we’ll keep trying. Weeknight dinners here aren’t always fancy. Sometimes they are just whatever is in the fridge, thrown together in the most nutritious, speedy way possible. But a birthday dinner had to be good. 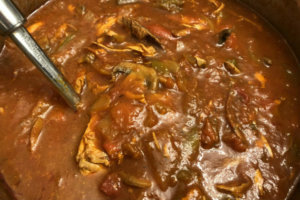 I decided to make chicken cacciatore in the crockpot. I used two packages of thinly sliced chicken breasts; three peppers, cored and sliced; two yellow onions, roughly chopped/sliced; one package of fresh mushrooms, sliced; two jars of pasta sauce (I used two different brands). I threw it all in the pot with a little extra water because the boys always like extra broth, and cooked it for 10 hours on low. I’m sure it was ready sooner, but that’s how long I cook crockpot meals. It was the best dinner I made all week, but there wasn’t much competition. 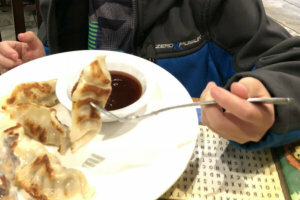 We went out to dinner last night, and I ordered Daniel a plate of dumplings. Our waitress brought them to the table, and he started eating. “Do you like them?” I asked. The other night Daniel decided he needed a drum set. He disappeared into the basement with his father, and they got to work creating a homemade model. 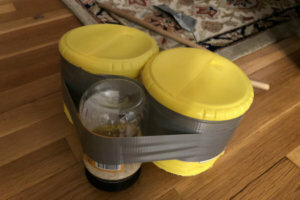 Two Domino sugar containers, a pickle jar, a piece of yarn, and some duct tape, and we have a drummer marching around the house with our trumpet player. Yesterday I had the opportunity to go to an event at Spark, a collaborative workspace in downtown Baltimore. It’s an exciting space, and I loved the concept, the architecture, and how everything was designed. It reminded me of Alice in Wonderland. 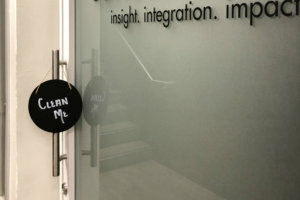 It also made me think that our whole house should probably have a “Clean me” sign. Read more quick takes at Kelly’s blog, This Ain’t the Lyceum, and have a wonderful weekend.